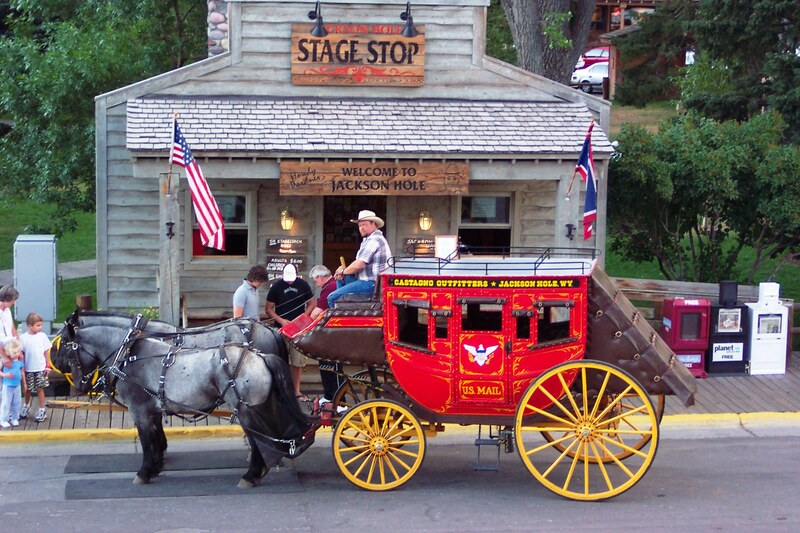 Stagecoach rides offer unique sightseeing in Jackson. 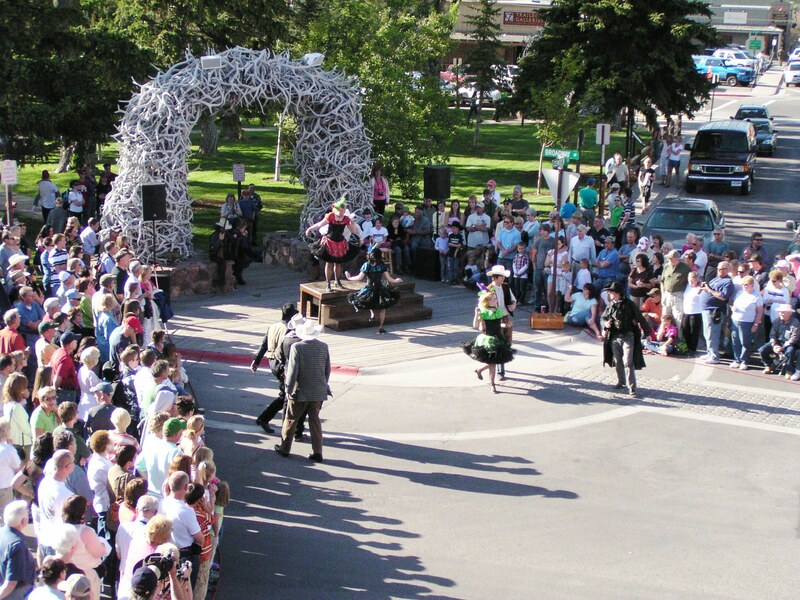 Jackson's historic Town Square's signature elk antler arches are the backdrop for a shoot-out reenactment, performed every summer evening since 1957. Jackson, Wyoming, (population 8,647) is the only incorporated municipality in Teton County. Native people began to use the valley about 11,000 years ago. Mountain men wrote the first accounts of the location as they moved through the area trapping beaver. Trapper David Jackson gave his name to the valley when he spent the winter of 1829 on the shores of Jackson Lake. For the mountain men, a “hole” indicated a high valley surrounded by mountains, and William Sublette, who was Jackson’s partner in an early fur company, referred to the mountain valley along the Snake River as Jackson’s Hole. Jackson Hole was settled later than many other parts of the West. Because of the short growing seasons, early settlers barely subsisted. Unlike other western areas, mining here was not a success. Tourism was economically important early on, as visitors came to fish and hunt, and to experience the wilderness and open spaces that came to sustain western cattle operations. Outfitting and guiding supplemented ranching income. Eventually, some ranchers determined that wrangling dudes was easier and more profitable than wrangling cows, and Jackson began its transformation into the resort community it remains today. The frontier town of Jackson sprouted in the late 1890s. It had mercantile establishments, a post office, a school, cafes, saloons, churches, hotels, a playhouse, a rodeo, and a jail. The town of Jackson was incorporated in 1914 and began to grow as more people traveled to and settled in Wyoming. Jackson elected the first all-female city council in the United States in 1920, the very year the 19th amendment was passed. The event that had, and continues to have, the most profound impact on the future of the region was the formation of Grand Teton National Park and the designation of other federal lands. Tourism tied to the world-class natural landscape and local history has made a great contribution to the local economy, but pressure for growth and additional development is intense, raising concerns about the destruction of the very things that attract visitors. Jackson’s historic Town Square is part of a Downtown Historic District and a center of western heritage activity. Interpretive signs featuring compelling stories and historic photographs, a 2005 project of the Jackson Hole Historical Society and Museum and the Chamber of Commerce, are installed around the square. Bi-weekly walking tours assemble in the square, and a private vendor offers stagecoach rides. The square’s signature elk antler arches are the backdrop for a shoot-out reenactment, performed every summer evening since 1957. The arches and the wooden walkways are being restored through a partnership between the town and Jackson’s three Rotary Clubs.